Regarding other NATO protests in Edinburgh, have had some updates from someone studying the post-Tomlinson policing effort. After ploughshares activists were arrested for non-violent direct action there was a clampdown. The city was under a section 60 all weekend anyway. 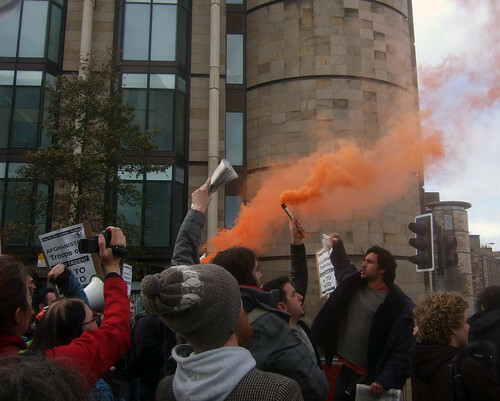 Activists, many of them elderly, protesting at a speech of the NATO secretary-general at Edinburgh University were kettled. One anonymous poster on Indymedia Scotland complained of being "dragged and thrown over barriers and down steps". "The protestors asked repeatedly what law they were being held under and were told variously that they were being detained to ‘prevent a breach of the peace’ and that ‘their association with the activists arrested that morning’ made them suspicious. One of the key recommendations of the G20 reports was that ‘there needs to be an exit strategy for those contained’ and that there needs to be good communication and consideration of facilities like food, water, shelter, toilet facilities and medical aid (HMIC 2009: 44). In this instance the legal provisions offered by the catch-all breach of the peace legislation were used to detain a group of some 15 people (hardly a public order problem) for two and half hours." They were then released, but police followed them to the Elephant House Cafe and instructed staff to make sure the exits were sealed! In case they were trying to pull a quick getaway you understand.